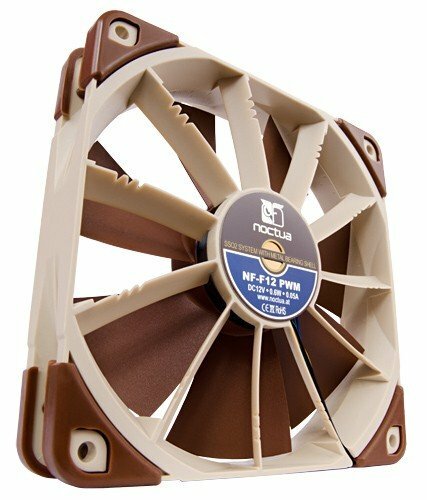 Noctua introduced the NF-F12, a 120mm "Focused Flow" PWM fan. The company says this fan is optimized for outstanding static pressure, it focuses the airflow for better performance on heatsinks and radiators. The fan spins at up to 1500RPM, at this rotational speed it moves 55CFM with a static pressure of 2.61 mm H2O and a noise level of 22.4dBA The MSRP is 19.90EUR ($24.90), it should be immediately available in retail stores. "Our award-winning NF-P12 has become a standard choice for pressure demanding applications such as CPU coolers and radiators, but we’ve been striving to achieve even better performance in this domain, and this is how the NF-F12 was born", explains Mag. Roland Mossig, Noctua CEO. "Due to the stator guide vanes focussing the airflow, it can push the air through dense fin stacks more effectively. This type of design has mostly been used for noisy high speed fans so far, so our engineers have put a lot of thought into keeping the noise in check."